Duisberg, Wilhem-Lehmbruck-Museum, Das Bild der Frau in der Plastik des 20. Jahrhunderts, May-June 1986, p. 186, no. 42. Laundromat is a moving evocation of modern living. Utilising the enduring stillness of his plaster cast figures, Segal presents in this work a stark exposition of humanity set against the synthetic and mechanical environment of twentieth century life. In Laundromat, these idiosyncrasies of humanity and of life are emphasized by their being shown in direct frontal contrast with a variety of objects from a modern launderette. In this way a horizontal parade of form is established contrasting the harsh angularity and cold hard surfaces of the metal and plastic furnishings with the seemingly soft and intensely detailed animate form of a woman reading. As Segal has observed, this deliberate contrasting of the forms of his figures and the smooth-surfaced forms of modern technology lies at the heart of his work. "I happen to need, I think, my own peculiar combination of hard, harsh, austere architecture, plus some kind of softness, gentleness, roundness or voluptuousness," he has said. "Its my own kind of balance." 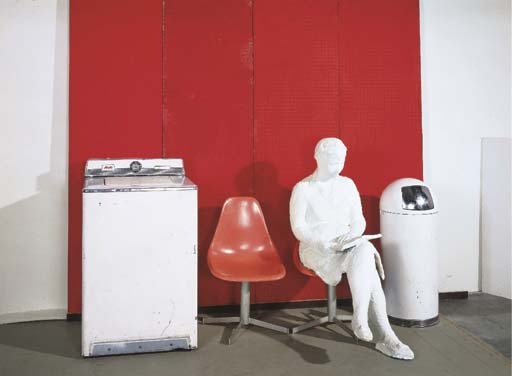 (cited in George Segal: Sculptures, exh. cat., Walker Art Center, Minneapolis, 1979, p. 68). The balance that Segal establishes in Laundromat is primarily achieved through the direct frontality of the work which in turn emphasises the figure's isolation. In this respect Laundromat recalls the work of Edward Hopper, an artist whose work formed an important influence on Segal precisely because it managed to express the inner emotions of a person through a careful scrutiny of their exterior form and its interaction with their environment. "The reason I admire (Hopper) so much," Segal has commented, "is that he never stopped looking at the real world - with all the danger of being a naturalistic illustrator. Now, there's a difference being an illustrator (and he made his living that way and it must have caused him untold private agony). But for him to use the real stuff of the world and somehow - not suddenly but painstakingly, painfully, slowly - figure out how to stack the elements into a heap that began talking very tellingly of his own deepest inner feelings, he had to make some kind of marriage between what he could see outside with his eyes, touch with his hands, and the feelings that were going on inside. Now I think that's as simply as I can say what I think art is about." (cited in Tuchman, op. cit., p. 64).